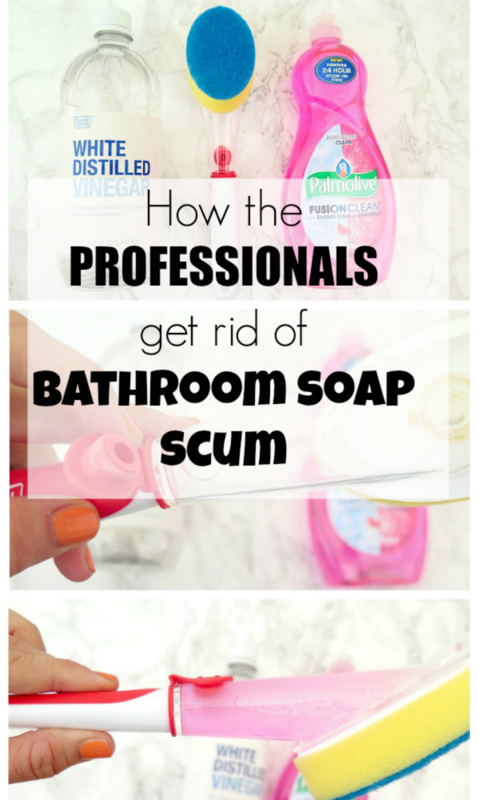 Bathroom soap scum … totally un-glamorous and completely annoying. It pops up and just won’t go away. It also can make an otherwise perfectly clean bathroom look totally dirty. I always wait until the soap scum is so bad that I know I just need to clean it. By then it’s too late. Well not ‘too late’ as in I can never get rid of it. But ‘too late’ for it to be an easy chore. I then proceed to spend at least 30 minutes trying to get the shower to look presentable only to realize I barely made a dent. Then I give up. Fast forward a week or two later and I do the same thing. Eventually I stopped repeating my inefficient system (hello insanity) and figured out something better. 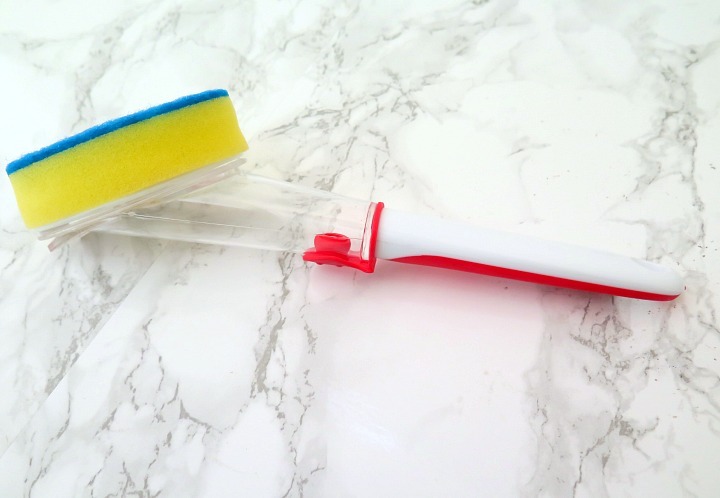 Open up your scrubber and fill it 1/3 with dish detergent and 2/3 with vinegar. The soap and vinegar may not mix together at the beginning. Totally fine. You can always give it a quick shake before you use it. 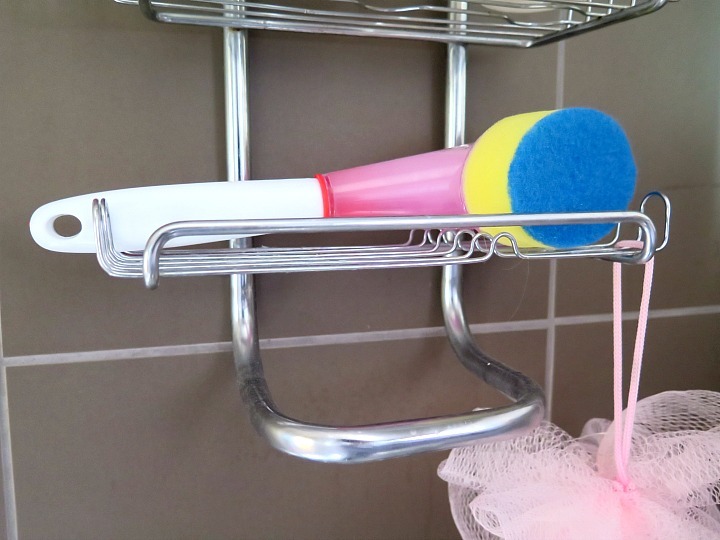 I place one in each of our showers, keeping the actual scrubber part facing up. I do this so that the vinegar and detergent don’t leak out. Even if it leaks a little, it’s definitely not a big deal. Now her’es the trick …. 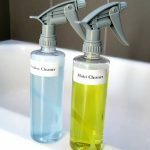 Instead of using it when your’e cleaning your bathroom, use it while you’re taking a shower! 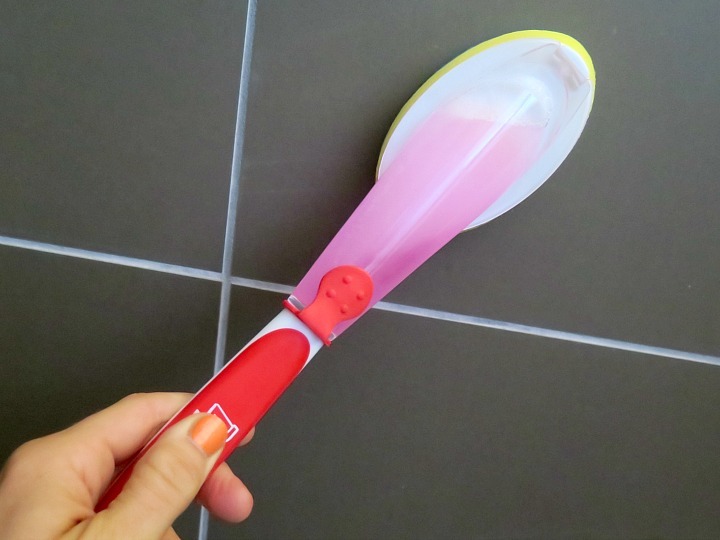 So when you’re in the shower use your scrubber to wash the walls. The hot water & steam of the shower will increase the cleaning ability. And continuing the shower water once you’re finished cleaning will ensure that the detergent and vinegar are washed OFF the walls. 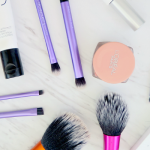 I use the scrubber probably 3 times a week and only scrub for maybe 30 seconds each time. Instead of having to DEEP (and I mean DEEP) clean my shower once a week month, I use the scrubber a couple times a week. It’s made a HUGE difference in keeping up with soap scum and making our shower look presentable. 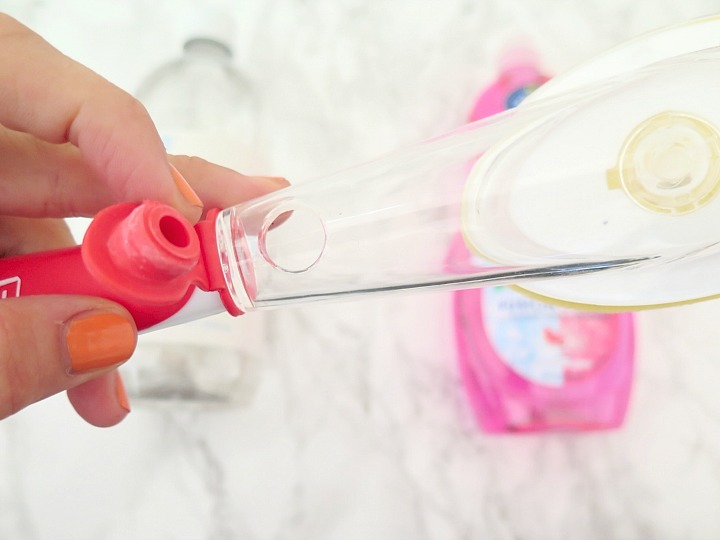 Who doesn’t love cleaning hacks?! 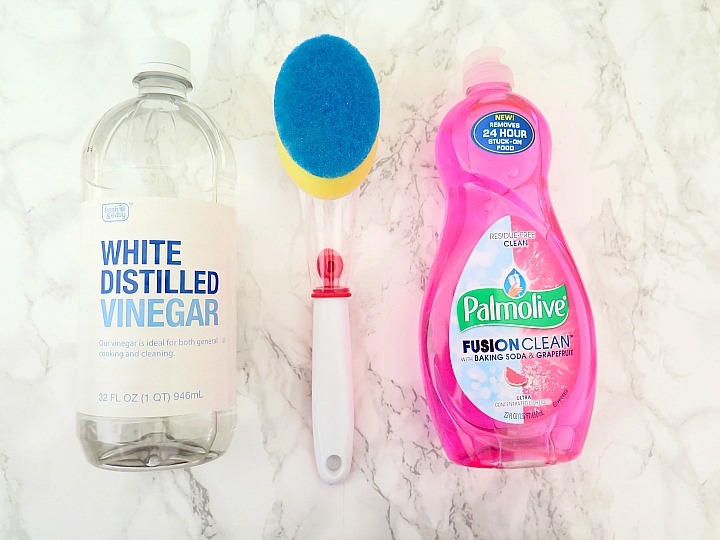 Now if the rest of your bathroom is looking like the equivalent of that soap scum, take a look at our 5 Tips to Always Have A Clean Bathroom. 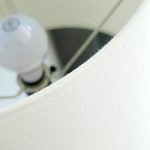 These quick and painless tips will have your place looking amazing in now time! 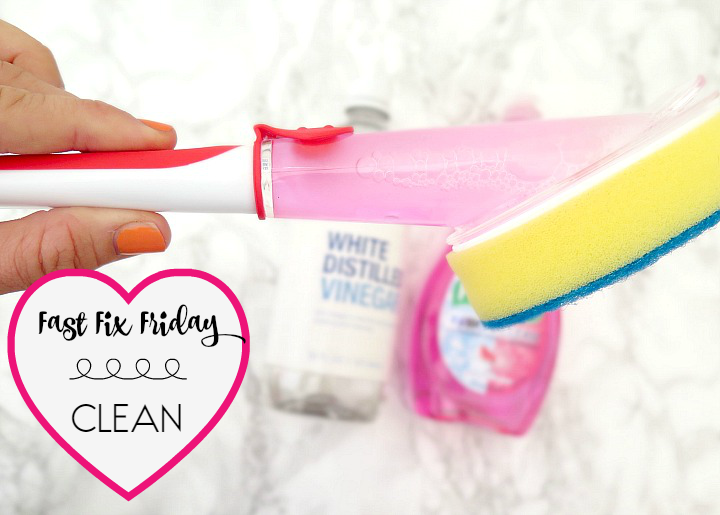 Who doesn’t love an easy cleaning hack?! 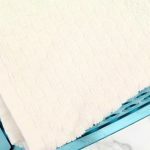 Previous Post: « Under the Sink Bathroom Storage Solutions + Giveaway! What an awesome idea! I’ll have to give it a try. Cleaning the shower = my worst nightmare. Truly I would rather clean the toilet than the shower. The toilet all I have to do is put some toilet bowl cleaner in, let it set, scrub a bit and done. The shower = way too much time to do therefore resulting in me never wanting to do it which then means it takes even longer when I do get around to doing it. This little trick makes it so much easier!! Thank you!